Catch Basin Cleaning – Will It Be Panic or Peace? At a minimum, your catch basin should be serviced at least once a year. 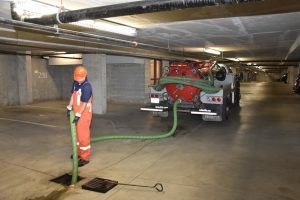 Whether your drain is in the middle of a surface parking lot, or in the basement of an underground parkade, a clogged catch basin can be a huge inconvenience. Our fleet of specialized vacuum pump trucks will take care of your catch basin cleaning quickly and efficiently. We have the biggest fleet of “LowBoy” trucks in the lower mainland to get at the toughest catch basin locations. Don’t wait for a problem. When you need catch basin service in Vancouver, Aldergrove, Surrey, Langley, Burnaby, New Westminster, Delta or White Rock, contact Edenflo Pump Truck Services at 604-575-1414 and schedule your annual catch-basin inspection and cleaning today. This entry was posted in Catch Basin Cleaning and tagged Abbotsford catch basin cleaning, alder grove catch basin cleaning, Aldergrove catch basin cleaning, BC catch basin cleaning, burnaby catch basin cleaning, Catch Basin Cleaning Aldergrove, Catch Basin Cleaning and Maintenance, Catch basin cleaning Delta, catch basin cleaning New Westminster, Catch Basin cleaning Richmond, Catch Basin cleaning Surrey, Catch Basin Cleaning Vancouver, Delta Catch Basin Cleaning, parking lot drain back up vancouver, Parking lot drain cleaning, parking lot flooding BC, parking lot flooding Vancouver, underground parkade drain cleaning, underground parking drain cleaning on October 23, 2018 by Edenflo.